Download this FREE goal setting worksheet to help you create SMART goals. It provides complete guidance for setting and achieving goals! This worksheet will help you create a well-defined goal statement, understand why the goal is important, and help you determine what support you will need from others. It also includes a checklist to make sure your goal is SMART and space to create an Action Plan. Write your goal statement in this box. You should be able to do this in one or two sentences. In this box, explain why this goal is important and worth accomplishing at this time. If this is a business goal, explain how it relates to your company or project strategy. If this is a personal goal, explain how it will impact your life. Section 3: What is needed to accomplish this goal? In this section, list the people, material, and equipment you will need to accomplish the goal. Use the SMART Goal Checklist to make sure your goal is well-defined. Is it clear what needs to be done to accomplish the goal? Is it clear who owns the goal and who you need to get support from to accomplish the goal? Is it clear when the goal needs to be accomplished by? Do you know how you will know when the goal has been completed? Does the goal statement indicate how many, how often, or how much? Do you feel you can achieve the goal by the target date? Do you feel you can get the support you need from others to accomplish the goal? Do you have access to all the material and equipment you need to accomplish the goal in the specified time period? Is your goal important for achieving your business strategy? Is your goal going to improve your personal life? Does your goal statement indicate when the goal needs to be completed? In this section, identify the key actions that need to be taken to complete your goal. Note who needs to take the action and when it should be completed by. 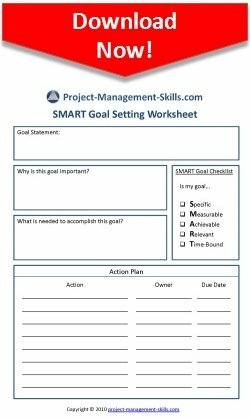 Download this free Goal Setting Worksheet to make sure you set SMART Goals! Setting SMART goals is one of the most powerful skills a project manager needs to master to be successful. Learn effective goal setting strategies you can use today.